The summer of 2018 will be the first real test for the still nascent G5 Sahel Joint Force (Force conjointe du G5 Sahel or FC-G5S). On June 29, exactly a month before Mali’s presidential election, the FC-G5S headquarters in the Central Mali town of Sévaré was the subject of a complex car bomb and gunfire attack claimed by the al-Qaeda-linked Group for the Support of Islam and Muslims (GSIM). A few days later, at the G5 summit—held on the sidelines of the last African Union (AU) summit in Nouakchott—heads of state decided to replace the FC-G5S’ first commander, Malian general Didier Dacko, along with his deputy. There were multiple reasons for this decision. The 5,000 strong FC-G5S counterterrorism force, officially launched in July 2017, has had a slow start and so far has had a limited impact on the continually deteriorating security situation in Central Mali. This is all the more problematic as incumbent Malian President Ibrahim Boubacar Keita had been elected in 2013 on the promise to curb violence, and his 2018 campaign also focused heavily on security, including the promise to “recruit several thousand new military.” Under international pressure, the Malian government also recently had to investigate and recognize abuses and killing of civilians by its troops, including those under FC-G5S command. The replacement of the joint force’s leadership with Mauritanian General Hanena Ould Sidi, and Chadian General Oumar Bikimo as his deputy, may also be an attempt to incentivize two countries who have largely remained on the margin of the G5 (despite Chadian troops commanded by the same Bikimo playing a key role in the French Serval offensive back in January 2013). The first few operations of the joint force had only included the Malian, Burkina Faso, and Niger armed forces at their common borders—called the Liptako Gourma region—with support from the French Barkhane regional counterterrorism force. But at the beginning of July, Chad and Niger apparently collaborated in an operation at the Libyan border. For their part, the Mauritanian and Chadian armies are thought to be the most capable and seasoned in desert terrain of the five armies, and each contribute a 750 soldier battalion to the joint force. This should, however, not distract from the fact that the shake-up of the FC-G5S needs to start at home in each of the five countries, and in Mali in particular, the country most affected by the threat of terrorism. The FC-G5S is sometimes misunderstood as being another peace operation of the type the United Nations or the AU would deploy. Instead, each of the five armies concerned operates—for the time being—in their own country, in a strip of 50 kilometers on their side of the border, with a right of pursuit. This builds on about twenty joint cross-border military operations (OMCT in French) carried out in previous years with support from Barkhane, in terms of planning, communication, air cover, and medical evacuation, with French troops operating alongside African armies. The FC-G5S Concept of Operations envisages a second phase when the force would operate in other parts of the G5 space, but this remains hypothetical at this stage. Much energy has so far been spent on financing and operationalizing the joint force. Pledges made in the lead up to the February 2018 Brussels conference—including, notably, $100 million from Saudi Arabia, €100 million from the EU, $30 million from United Arab Emirates, and a promise of $60 million in bilateral support to FC-G5S armies from the US—have been slow to translate to progress on the ground, have mostly been used for the purchasing of equipment, and led to a feud over the control of the funds. This also falls short of the estimated €423 million budget for the first year, and a number of donors seem uncomfortable with funding the annual €75 million operating costs of armed forces within their homeland for years to come. The EU Training Mission in Mali has already spent €33.4 million annually since 2013 for the training of Malian armed forces and its mandate was just extended for two years and amended to include the provision of advice and training support to the FC-G5S. Short of full UN support and a funding package under Chapter VII of the UN Charter—which Secretary-General Antonio Guterres continues to advocate for despite other voices calling for a better distinction between peacekeeping and counterterrorism—the Security Council, under resolution 2391, only authorized limited operational and logistical support from the UN Multidimensional Integrated Stabilization Mission in Mali (MINUSMA) to the FC-G5S. A February 2018 technical agreement between the UN, EU, and G5 Sahel states details the medical/casualty evacuation, engineering, and logistical support costs for an estimated total of €44 million over two years, subject to full reimbursement to the UN. Talk over the past few months has also been on better coordinating security and development approaches, with 500 development projects envisaged under the Sahel Alliance over the next five years—an initially Franco-German led European initiative in support of the G5 Sahel, with support from others—and the foreseen launch of a G5 Sahel Priority Investment Program, as well as the addition of a police component to the FC-G5S to foster police and judicial cooperation between G5 countries. Related to this is the challenge for Maman Sidikou—previously head of the UN mission in the Democratic Republic of Congo and the AU mission in Somalia—who took over the Permanent Secretariat of the G5 Sahel in February and formally has authority over the FC-G5S, to ensure that military and development actions are indeed better balanced, but also, and most importantly, that these follow a somewhat common regional political strategy. This especially as each of the G5 countries have followed different paths in dealing with what they see as their domestic terrorist threats. But now that the Sisyphean FC-G5S is slowly becoming operational, concerns over abuses by some of its forces is growing, despite G5 member states having committed to adopt a robust human rights and international humanitarian law compliance framework. In June, the Malian government recognized the implication that some of its soldiers were involved in the extrajudicial killings of 25 Fulani civilians near Mopti in Central Mali. Around the same time, MINUSMA reported that Malian soldiers attached to the FC-G5S were responsible for killing 12 civilians in the border town of Boulikessi. Burkinabe troops across the border have been accused of similar abuses. The reported ambiguous relations of the state with local militias, and a divide and rule approach to counterinsurgency from central to eastern Mali—including the Dan na Amassagou militia, despite the Malian prime minister announcing in March that the state would disarm militias—has also fueled intercommunal violence, including across the border into Niger’s Tillabéri Region. This not only calls into question international operational and training support provided to date, but is cause for concern given the fact that the most determinant factor contributing to vulnerability to violent extremism and youth joining armed groups in the Sahel is the experience of abuse and violation by the state, as multiple recent studies show. The needed behavior change in security forces can only come from political leadership, messaging from the top of each of these states, and genuine security sector reform (SSR), which should not be confused with capacity building efforts undertaken to date that have for the most part consolidated dysfunctional ancient organizational models rather than encouraged their reform. The problem is that the regional counterterrorism framework provided by the FC-G5S, although it may help deny safe havens to terrorist groups at border areas, has so far not compelled states to embark on such genuine SSR. Building or fixing a plane while flying is never easy, and the imperative of operational results tends to favor military gizmos over building legitimate and accountable forces, i.e., state security over human security. Creating a regional parliamentary mechanism to provide democratic oversight to the G5 Sahel governance, and the recently inaugurated G5 Defense College in Nouakchott (to train and prepare officers) as well as the Security Cooperation Platform (for sharing operational intelligence), are not bad ideas in principle, but civilian oversight and accountability of defense and security forces needs to start at home. Furthermore, the FC-G5S will always be as credible as each of the participating armies is at home and will only be as effective as its weakest members. There is also the risk that if the FC-G5S is perceived as a foreign force controlling the national army, it could further undermine the legitimacy of states failing to provide basic services and to gain the trust of its people. The feeling among Mali’s neighbors is that, although it is the country most concerned, it is also the one that does the least about it politically and militarily. 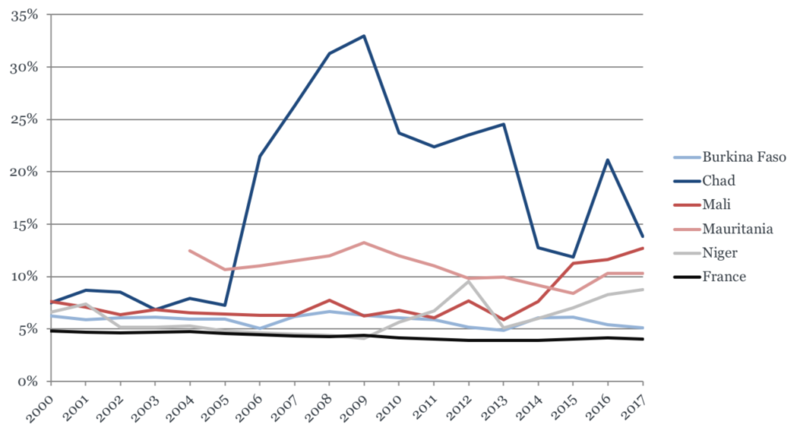 Mali, which experienced a military coup in 2012 and is not exempt from internal tensions, has since doubled its military expenditure as a percentage of government spending (see graph). Malian President Keita received four A-29 Super Tucano attack planes a few days ago and Russian and French helicopters last year. Although key non-permanent institutions—national SSR, disarmament, demobilization, and reintegration (DDR), and integration commissions—and some joint patrols, which were only meant to be an interim confidence building measure, have been established, most of the key security provisions of the 2015 inter-Malian peace agreement have yet to be implemented. These include reconstituting defense and security forces following the DDR and integration of ex-rebels and creating a territorial police accountable to local authorities, as well as local dialogue mechanisms between communities and defense and security forces. These provisions are, of course, key to rendering defense and security forces more inclusive and representative of the population, and thereby better accepted, more legitimate, motivated, and effective. The FC-G5S is often thought of as a potential medium-term exit strategy for both Barkhane and MINUSMA. The rationale for a regional approach to a regional problem may have some validity, and the UN peacekeeping’s force geographical limitation to the boundaries of Mali has been a challenge when armed groups of all types operate across borders. However, the joint force should not become yet another pretext for not carrying out the needed governance reforms to address the root causes of violent extremism and insecurity at home in each of the five countries, and in Mali in particular. Reforming Malian security and governance system will also make the country better able to cooperate effectively with security institutions from its G5 Sahel neighboring countries and beyond. No one is under the illusion that the Malian presidential election will fundamentally change the political landscape, but it could serve to restart discussions between Malian authorities and its many, but too often uncoordinated international partners on a genuine and holistic medium-term SSR vision and a realistic strategy adapted to the needs of populations and to new security threats. Although a draft national SSR strategy was prepared in March with support from MINUSMA, much remains to be done to ensure its broad ownership within Malian society—participative at the level of populations, politically supported at the top of the state, and functional as a guide to sector-specific reforms and resource allocations. The “Pact for Peace” between the government of Mali and the UN, which should include mutual commitments that the latest Security Council resolution 2423 on Mali calls for, could be a useful vehicle for such discussions. That SSR vision should aim to reconcile the effectiveness of defense and security forces with democratic governance and accountability within the security system. Human security should, above all, be at its core.